Most muscle car enthusiasts will tell you that 1970 was the pinnacle year for the muscle car. Muscle machines like the Chevrolet Chevelle SS, Dodge Charger R/T, and Ford Torino Cobra ruled the streets, waged war with each other at the stoplight, and burned up the drag strip on weekends. It was also a time when Uncle Sam and the insurance companies were putting the squeeze on automakers to manufacturer more fuel efficient and safer vehicles. 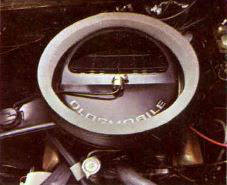 During this time, the guys at Oldsmobile came up with a solution to this dilemma. Create a car with the muscle car look and feel but with an engine and drivetrain that helped reduce the strain of insurance costs. The result was the Rallye 350. 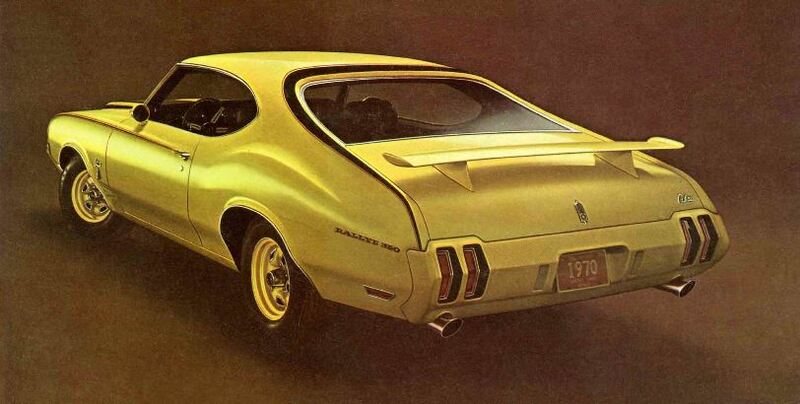 In this edition of Muscle Car Milestones, we’ll take a look at the 1970 Oldsmobile Rallye 350. A car that really didn’t compromise on performance as much as it kept the insurance companies from robbing your wallet. It was also a car for the budget-minded that didn’t feel stripped down or second class. 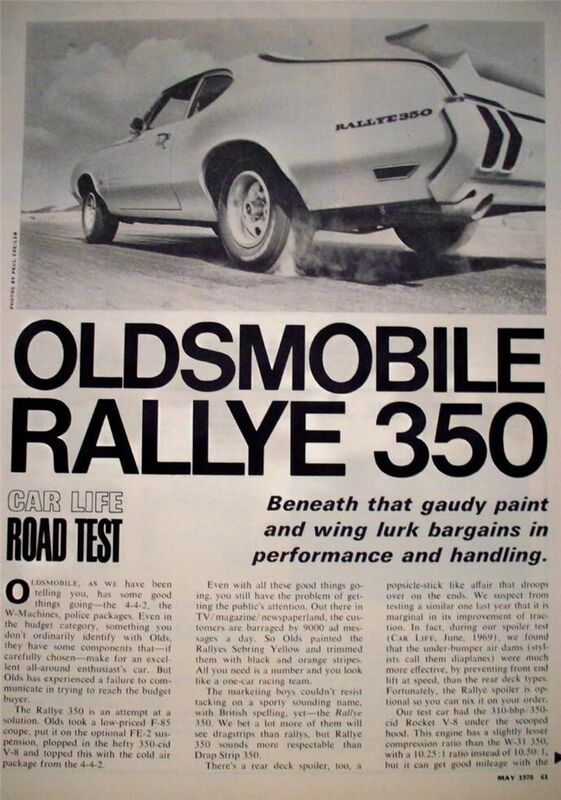 Yep, for those looking to get into their first muscle car, the Rallye 350 was the best of both worlds. The Rallye 350 came with a plethora standard equipment such as black interior trim, sport steering wheel, and 310 horsepower V8. With insurance company surcharges chasing away sales of muscle cars, Detroit began offering budget muscle cars to the buying public. Cars such as the Plymouth Road Runner, Pontiac GT-37, and Chevrolet Heavy Chevy Chevelle were some of the popular, reasonably priced cars muscle cars in the early 70s. Not wanting to be left out, Oldsmobile created the Rallye 350. Sales were marginal with only 3,547 of these screaming yellow coupes finding their way to attracted buyers. Today, sightings of the Rallye 350 are rare and attract attention when brought to car shows and cruise-ins around the country. 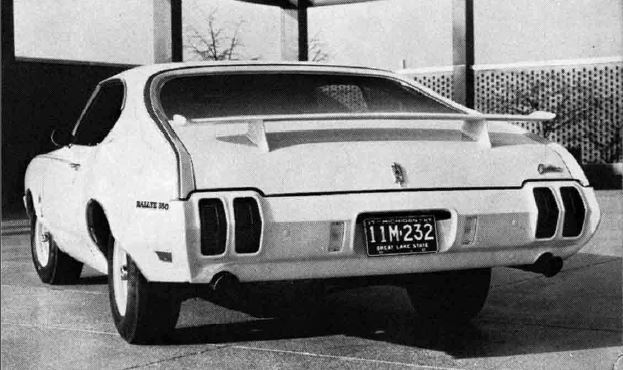 The Rallye 350 was available on the Cutlass S Hardtop Coupe, Cutlass S Sport Coupe, and the F-85 Coupe. All the buyer had to do was check off option number W45 on the order form for the Rallye 350 Appearance Package. The package included Sebring Yellow paint, blacked-out grille, and black and orange decals on the hood, front fender peaks, and rear body silhouette. It also included yellow Super Stock wheels, 670 x 14-inch bias belted wide oval blackwall tires, and body-color bumpers. A fiberglass hood with twin scoops and chrome latches and flared exhaust tips helped the Rallye 350 mimic the look of the 442. The cost for the Rallye 350 package was around $158. A rear deck spoiler, disc brakes, and variable-ratio power steering were a few of the available options available to enhance the look and feel of this sporty coupe. Interiors of the Rallye 350 varied slightly. Depending on the model (F-85 or Cutlass) ordered, some cars came with bucket seats and carpeting and some came equipped with a bench seat and rubber floor covering. 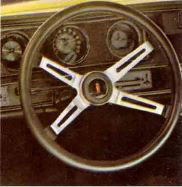 A Custom-Sport 4-spoke steering wheel with grained vinyl provided a sure grip in the hands of the driver. Black was the sole interior color available for the car. Just because the Rallye 350 is a “budget” muscle car doesn’t mean Oldsmobile skimped on available amenities. The car could be ordered with Rally Pac gauges, power door locks and mirrors, and AM/FM stereo. Buyers could also order power steering, power brakes, and tinted glass. The only engine available in the Rallye 350 was the L74 Rocket 350 V8 with a Rochester 4-barrel carburetor. A single snorkel air cleaner feeds oxygen to the engine. At or near full throttle, a vacuum-operated air flap attached to the air cleaner opens and allows the engine to breathe through the twin hood scoops. This engine could be mated to either a 3-speed or 4-speed manual or a Turbo 350 automatic. The yellow cruiser was rated at 310 horsepower with maximum torque rated at 390 foot-pounds. Oldsmobile gave the Rallye 350 some extra oomph where it counted. Helping keep the Rallye 350 glued to the road was the FE2 Rally Suspension Package. The package included front and rear stabilizer bars along with heavy duty springs. It was included when ordering the Rallye 350. Drum brakes were standard on the front and rear. However, for a little extra stopping power, front discs were an available option. 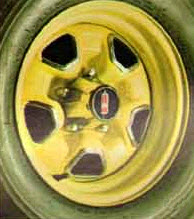 The standard wheel was the 14 x 7-inch Super Stock II. 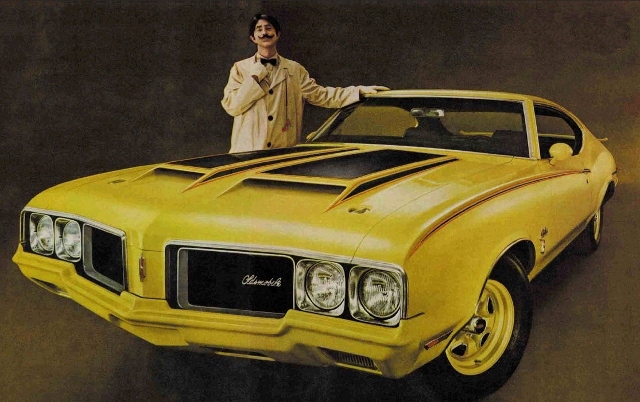 These were painted yellow and included bright center caps with the Oldsmobile rocket logo. Standard tires were 14-inch blackwalls but white stripe or white letter tires were available to check off on the option sheet. The standard rear end was a 3.23:1 but a 3.42:1 and 3.91 were also available. Even though the Rallye 350 was a muscle car for the budget-minded, it performed fairly well in road tests. Car Life tested the car for their May 1970 issue. It ran from 0–60 in 7 seconds and dashed the quarter mile in 15.27 seconds running 94 mph. Not too shabby for a 3,500 pound car with only 310 horsepower. The numbers are pretty similar to the 1970 Plymouth Road Runner with the 335 horsepower 383 cubic-inch V8. The Road Runner ran from 0–60 in 7.1 seconds and completed the quarter in 15 seconds reaching 96 mph. A recent search of auction and classified sites shows prices for a Rallye 350 are fairly reasonable. An internet search found examples for sale ranging from $16,000 to $36,000. These prices are roughly half the asking price of the 1970 442. Just like it was in 1970, the Rallye 350 is still an affordable muscle car today. Just as fast as it appeared on the scene, the Rallye 350 disappeared in a flash at the end of the 1970 model year. 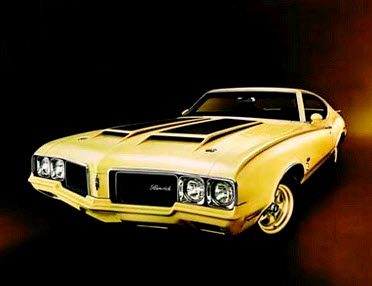 During its one year production run, Oldsmobile built only 3,547 of these yellow coupes. Though not as popular or as quick as the 442, the Rallye 350 still has earned a spot in muscle car history.